Our coverage of Walt Mossberg’s interview with Steve Jobs at the D: All Things Digital event has concluded. 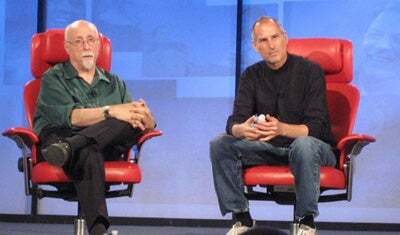 Apple CEO Jobs sat down on Wednesday with Wall Street Journal tech columnist Walt Mossberg to discuss the state of Apple, new products and more at the Wall Street Journal’s D: All Things Digital event in Carlsbad, Calif.
Mossberg asked Jobs what kind of businesses Apple is in. Jobs told him that Apple is in two businesses today — the Mac business, and the music business. And that Apple is entering a third business with the forthcoming release of the iPhone. The Apple TV represents a fourth opportunity for Apple, said Jobs, but he described it more as a hobby. “The reason I call it a hobby is, a lot of people have tried and failed to make it a business. And it’s a hard problem. So we’re trying. I think if we work on it and improve things over the next year, 18 months, we can crack that,” said Jobs. Walt Mossberg interviews Apple CEO Steve Jobs during a Wednesday session at D: All Things Digital. Mossberg referred to the Apple TV as a “set-top box,” and Jobs corrected him. “We thought of it as a set-top box replacement, but the minute you do that you get into a gnarly set of problems because you have to have the cable cards, and go through the cable companies, and they use this very strange software so you can implement their billing systems, and that’s just never something we would choose to do ourselves. We want to be a DVD player for the new Internet age. That’s our motto for the Apple TV: a DVD player for the Internet,” said Jobs. Some have criticized Apple’s decision not to sell HD-quality video from the iTunes Store, especially when the downloaded video can look pixelated or displays artifact on HDTVs connected to the Apple TV. “We’re not selling HD yet, because of the tradeoffs between download time and quality. But that might change in the future,” said Jobs. Jobs acknowledged the popularity of the Google-owned Internet video site, YouTube. “Wouldn’t it be great if you could see YouTube in your living room? So we’ve had a great opportunity to work with the YouTube folks, and we’re putting YouTube in the main menu,” he said. YouTube support in the Apple TV will be available to users as a free software download in mid-June, Jobs added. Jobs explained that Apple is “steadily trying to improve things” in the Mac market, and suggested that Apple makes the best notebooks and desktop computers in the world. “Our share in notebooks is ahead of the industry, two-thirds notebooks. I can see a time when notebooks are 80, 90 percent of what we sell. We’re also always improving our OS, generally have a release 18 months or so. And we had a big release we didn’t get much credit for, which is Mac OS X Tiger for Intel,” he said. Jobs pushed aside criticism that with Apple’s name change from Apple Computer to Apple Inc., it was setting aside the personal computer business for good. When asked by Mossberg if Apple remained committed to the Mac, Jobs responded enthusiastically. “You haven’t updated the iPod in a while,” Mossberg noted. “We’re working on the best iPods that we’ve ever done, and they’re awesome,” said Jobs. Jobs also noted in an audience question and answer session following Mossberg’s prepared queries that access to the Internet through the iPhone is unfettered by AT&T, using AT&T’s network. Jobs told Mossberg that Cingular — now AT&T — did a deal with Apple differently from the arrangements that it’s made with other cell phone makers. He attributes this to two major benefits Apple brings to the table — one is music, which Jobs says hasn’t been successful on phones so far, and the other is the ‘3G’ cell phone network. “They have spent a fortune building these 3G networks, and so far there ain’t a lot to do with them,” Jobs said wryly. Apple promises a richer multimedia and Internet experience with the iPhone than many of its competitors are capable of. Jobs said the iPhone is much like Apple’s iPod and the Mac itself — it’s “a software product in beautiful hardware.” That’s a conceptual leap that Jobs said Japanese manufacturers were incapable of making. “They’ve got their hardware down, but they haven’t been able to make the leap to software,” he explained. Many developers have expressed an interest in creating software to run on the iPhone after it was revealed that the iPhone runs Mac OS X. Jobs told Mossberg that users shouldn’t expect straightforward Mac OS X conversions, or ports, to run on the iPhone. Theoretically, could the iPhone run Mac OS X apps? Mossberg asked. Later asked by an audience member about writing applications for the iPhone, Jobs said that Apple ultimately wants both the iPhone to be secure and open without compromising either attribute. The last thing Apple wants, he suggested, is an iPhone that can be easily hacked or that crashes as a result of installing third party software. “I think sometime later this year we will find a way to let third parties write apps and still preserve security. But until we can find that way, we can’t compromise the security of the phone. Nobody’s perfect, but we sure don’t want our phone to crash. We would like to solve this problem, if you could be just a little more patient with us, I think everyone can get what they want,” he said. Apple on Wednesday also introduced its long awaited “iTunes Plus” feature on the iTunes Store, offering customers the ability to purchase and download DRM-free music at higher bit rates than was previously offered. While EMI is the first major commercial music publisher to offer its catalog in iTunes Plus format, Jobs said the next group will be independent music labels. “There’s zillions of independents jumping on this bandwagon, so as they get their stuff encoded you’ll be seeing more of them. Half of all the songs on iTunes will be available on iTunes Plus by the end of the year,” Jobs said, reiterating a milestone he mentioned when the news of DRM-free music for sale from iTunes first appeared in April. Apple is negotiating to bring other record companies in line, too. Benefits to the record companies include higher revenue, as the tracks cost moderately more, and the resolution of interoperability problems, as the songs are no longer limited to playback on iTunes or through an iPod (“iTunes Plus” is encoded using 256Kbps AAC format, so it’s playable by any music player or portable device that supports the AAC format). “We were successful in persuading EMI and hopefully over the rest of the year we’ll be successful with the rest of them,” said Jobs. After Mossberg opened the Q&A session to the audience, questions rolled in that covered the gamut of Steve Jobs’ Apple experience. Many attendees had questions about the upcoming iPhone. Others wanted to know more about Steve himself. Jobs confided to the audience after one question that he’s read some items on The Secret Diary of Steve Jobs, a “fake Steve” Weblog. “I have read some of those Fake Steve Jobs blog entries lately, and I thought they were pretty funny. And I get asked a lot if I know who it is, but I don’t. And it is pretty funny,” he said. Jobs said that the secret to Apple’s success isn’t in building huge factories. “All we are is our ideas, or people. That’s what keeps us going to work in the morning, to hang around these great bright people. I’ve always thought that recruiting is the heart and soul of what we do,” he said. “We make tools for people. Tools to create, tools to communicate. This age we’re living in, these tools surprise you. We didn’t think about education when we launched iTunes, but we launched iTunes U today. That’s why I love what we do. Because we make these tools, and we’re constantly surprised with what people do with them,” Jobs said. Coordinated by the Wall Street Journal , D: All Things Digital is an executive conference set at the Four Seasons Resort Avaria in Carlsbad, Calif. This is the fifth edition of the D event, dubbed D5. The interviews are being done by the Wall Street Journal’s Walt Mossberg and Kara Swisher. Among this year’s speakers are Microsoft chairman Bill Gates, Apple CEO Steve Jobs, Microsoft CEO Steve Ballmer, Palm founder Jeff Hawkins, Chad Hurley and Steve Chen, founders of Youtube, filmmaker George Lucas and many others. Jobs also appeared with Microsoft chairman Bill Gates at another D session later Wednesday. Macworld also provided coverage of that event. This story, "Steve Jobs at D: All Things Digital, Live Coverage" was originally published by PCWorld.